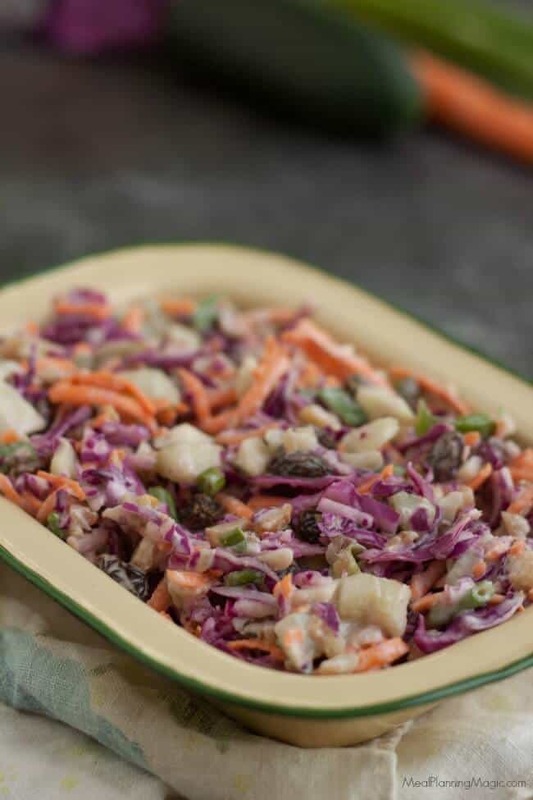 Filled with good for you vegetables, nuts and dried fruits, this Good For You Trailmix Coleslaw recipe is easy to make ahead and so delicious too! I originally shared this post over four years ago as part of a promotion for the Crunch A Color game. I’ve updated the photos and content here a bit to share this recipe with you again. I first developed this Good For You Trailmix Coleslaw after purchasing some from my local Kroger’s deli. 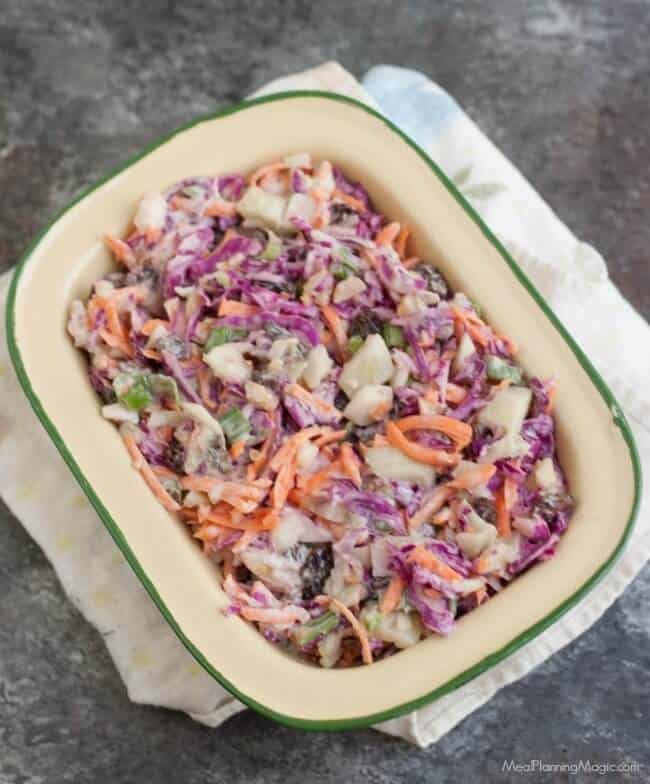 I loved how many different colors there were in the coleslaw and how good it is for you, hence the new name to remind you of that! I was inspired by the Crunch A Color Game because it encourages you to eat a variety of different color fruits and vegetables and this dish has that for sure! You can read more about the Crunch a Color game in my post Six Games and Ideas to Help Make Dinnertime More Fun! 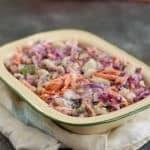 When I first tried this Trailmix Coleslaw made by my local grocery store, I could not find a recipe online that just like what I had tasted so I decided to create my own which I’m sharing with you here. It is SO easy and delicious. This is really tasty as a side dish but we’ve also had it on fish tacos or even with grilled chicken wrapped in a tortilla. 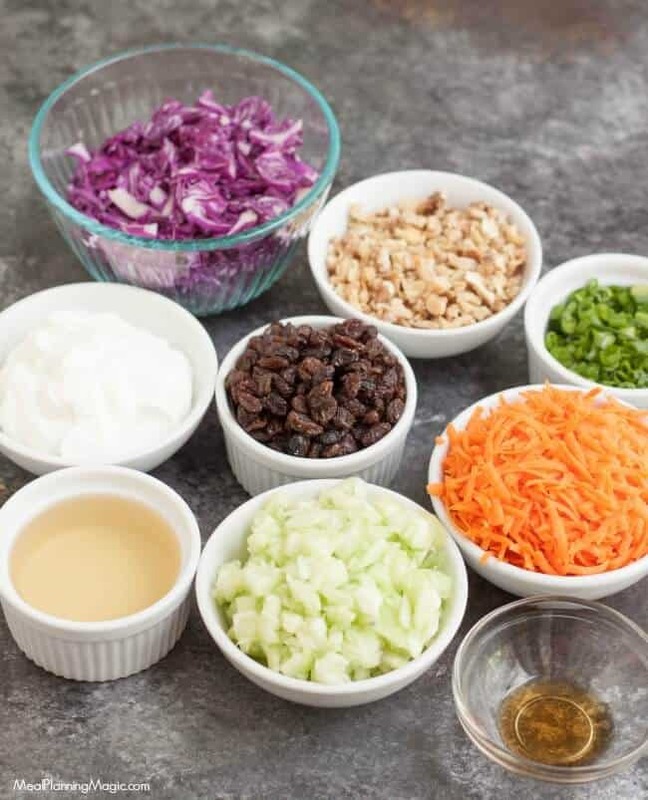 I love that my Good For You Trailmix Coleslaw has so many different colors in it too and that it’s super versatile! This recipe makes a lot, which makes it perfect to serve to a crowd but feel free to adjust the ingredient measurements to suit your family’s taste and needs. If you like more nuts, then add more! Or if you like a bit more cucumber, add more of that too. Or maybe you want to cut all the ingredient measurements in half so that you have just a bit to have for just one or two meals. It’s totally up to you! Note, the longer you let this sit, the more likely the purple cabbage will run and turn it all a pinkish color. It doesn’t affect the taste but if you if you want it to look fresh, just combine all the ingredients EXCEPT the purple cabbage before chilling. Add the purple cabbage (which you can chill in a separate airtight container in the refrigerator) just before serving and toss lightly to combine. 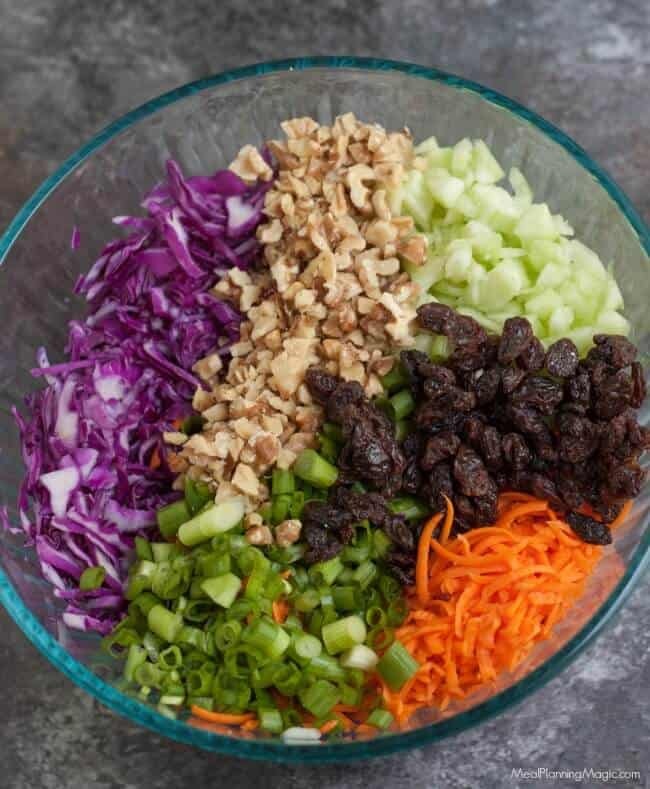 Filled with good for you vegetables, nuts and dried fruits, this Good For You Trailmix Coleslaw recipe is easy to make ahead and do delicious too! 1 cup dried fruit such as raisins dried cranberries, dried cherries, etc. Chill one to two hours before serving. Disclaimer: This post contains affiliate links. That means, if you choose to purchase anything mentioned here, I will receive a small commission—at not extra cost to you—as a thank you for the referral. 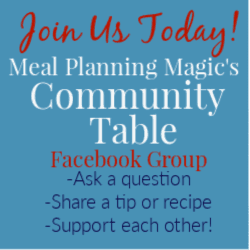 Thank YOU for your support of my blog!